Yay, Sis is here! Mom, Dad, and I met up with Chris’s mother, and we all went to greet Sis and her fiance Chris as they got off the train in Staunton. We took the Sable. They took the Cardinal from Chicago, and we were there to meet them. So we all got to the train station around 3 PM, and in came an Amtrak train. We thought it was us, but the conductor then announced that this train was going to Chicago, and thus not the train we were waiting for. So we went into the tiny little waiting room to wait. 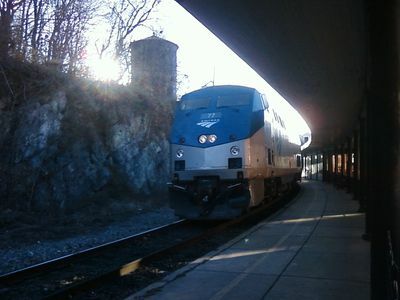 Interestingly enough, the Cardinal has to single-track through Staunton, as the station is only served by one track. Sis actually got caught up in the single-tracking, as they had to wait for the westbound Cardinal to clear the single-track area before they could proceed. Let me also comment that I will never take Union Station for granted again, since that station’s all nice and indoors and heated and has things to do while you wait. 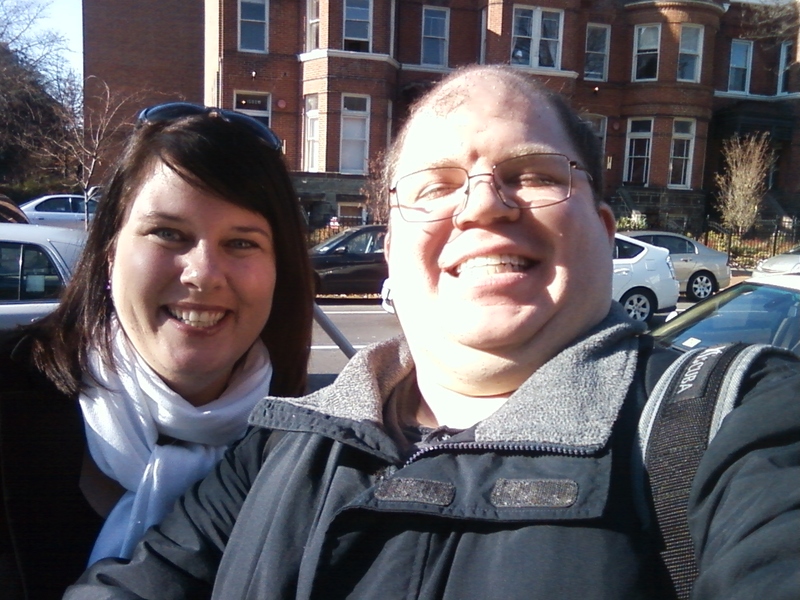 It was very cold and windy in Staunton today, and so waiting outside was not fun. And then waiting in the little waiting room is dull because there’s nothing to do. Just some benches. Then Katie texted me. As it turns out, my cell phone’s text message chime, which is four bell rings (think the out-of-time bell on Wheel of Fortune), sounds exactly like the bell on the Amtrak trains when they make a station stop. Thus my text tone got everyone’s attention, thinking that the train had arrived. After it was brought to my attention that lots of people were reacting every time I got a text, I explained to everyone that it was my phone. But eventually, the eastbound Cardinal arrived. First, a photo of the locomotive, for the railfan in me. I left without my real camera totally without thinking, unfortunately, and didn’t realize it until too late. 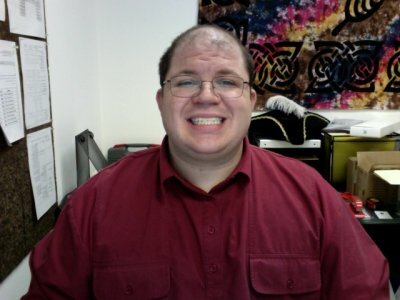 I just finished giving my apartment a thorough cleaning ahead of my trip to Stuarts Draft for a week. I did the rugs, I did the floors, I dusted, I completely cleaned the kitchen, and I completely cleaned the bathroom. It was a long ordeal, but the place looks great now! Most bothersome, though, was cleaning the carpets. I had Mom’s shampooer, and I went the whole nine yards. I picked everything up, moved furniture around, and everything. I had my coffee table up-ended and in the kitchen, if that tells you anything. Bedroom, hallway, and then living room. The living room was perhaps the most challenging. First I had to make sure not to shampoo myself into a corner, but also what to do once the carpets were done. \Determining what to do once the carpets were finished was actually pretty exciting. I grabbed my coat, my hat, my iPod, and my phone, and took to the Sable for a few hours late at night. Makes me glad that gas is cheaper again, because I finally got to explore a bit. It’s time to see what’s beyond Silver Spring. So I took a small late-night road trip. Previously, I’d only been on Georgia Avenue as far as Norbeck Road, which is not all that much further north than my street. Now, I followed Georgia Avenue a long way. I went through Olney, seeing roughly where Montgomery General Hospital is (the Y bus’s northern terminus), and continued, finding out that Georgia Avenue narrows down to two lanes once you clear Olney. Olney also appeared to be a lot smaller than I expected. I expected a larger town, but there you go. And then beyond Olney, Georgia Avenue reminded me a lot of various back roads in Augusta County, Virginia, where I used to live. Lots of curves, and two lanes. For the first time in a long time, I broke out the high beams. The question is, what crawled in the refrigerator and died? Gross. This very short workweek was my week on kitchen duty in the office, and ahead of being closed for a week and a half, I cleaned out the refrigerators. I will say this, though – the refrigerators don’t get cleaned out nearly as often as they should. My guideline for this particular fridge cleanout, given that the office would be closed for a while, was first and foremost for people to take home anything that they wanted to keep that might go bad during the time off. On anything that was left, I was pitching anything without a name on it, anything with an expiration date prior to when we’re supposed to come back, and of course, “fuzzy” stuff. We have two refrigerators. We have a small one and a large one. I started with the small one. That entailed just pulling a trash can up next to it, checking dates, and pitching stuff. The small refrigerator is generally not too bad. There were a few fuzzy things in there, but generally speaking, it wasn’t too bad. Now the second refrigerator, that thing was nearly full. So I pulled up a chair and a trash can, and got going. The thing that usually gets me in trouble, by the way, is when I open a container of something with the intention of dumping out the contents and saving the container. There was this container of rice in there. The container looked fairly new, and so I opened it with the intention of dumping out the rice. BIG MISTAKE. That rice was thoroughly rancid, and smelled every bit of it. It’s one of those smells that makes a beeline for the nose and then lingers there for a while. What an awful smell. I did not know that rice could make that smell. It can, as I soon found out. And it is not pleasant. It’s one of those smells where, as soon as you smell it, you wish you had just tossed the container sight unseen, but too late now, because the cat is out of the bag. If you ever need to remove wallpaper, this smell will do it. Put a flower next to it, and the stench will make it will turn brown instantly. Yeeew. Yes, there’s nothing like an evening of anti-consumerism Christmas caroling to really get you in the spirit of things this time of year. From 7 to 10 PM on Friday night, I, along with other like-minded DC area activists, did just that. We had our caroling session in Georgetown, at the intersection of M Street NW and Wisconsin Avenue NW, with The Shops at Georgetown Park on the southwest corner, and the PNC Bank building (former Riggs Bank building) on the northeast corner. What better place to protest consumerism and the current economic crisis than outside an upscale three-story shopping mall and a large bank, no? I left work at 5 PM as usual, and took Metro to Foggy Bottom. There, I walked west along Pennsylvania Avenue, crossing the bridge over Rock Creek Parkway and passing the Lukoil station to arrive in Georgetown. Then it was a few more blocks down M Street before I reached The Shops at Georgetown Park. There, I found a woman wearing a Santa hat, and so I took off my Gatsby cap, and put on the long Santa hat that I had previously worn to the Anon raid. Then the woman passed me a songbook, and we got busy singing. The songs were very creative, taking popular Christmas carols and writing new lyrics to fit our anti-consumerism theme. The words mostly fit the tunes, though a few parts here and there required us to think on our feet and be creative to make them fit properly. All in all, we did our best, and had fun. Ladies: Would you really want your guy smelling like a cheeseburger? You know, I thought it was enough getting used to the scent of the Brut. But then one of my coworkers forwarded me an Email about Burger King’s releasing a meat-scented cologne for men. Seriously. Take a look. I don’t know about you, but that’s not the kind of scent I would want to be spraying on myself. Honestly, the smell of meat is not the kind of scent I would want to wear to impress someone. Personally, if I encountered someone smelling like meat, I’d start to wonder. “So are you carrying a few hamburgers in your pocket, or are you just glad to see me?” Besides, hamburgers, and especially fast food hamburgers, are kind of gross. For that matter, Burger King food is just disgusting in general, and along with McDonald’s, I try to avoid it. Personally, I’ve never really seen the point of cologne in general. It makes you smell like something, but you usually have to really use your imagination to decide just what the stuff smells like. However, even the cheap stuff costs too much money, and too often, cologne is done badly by the person wearing it. I remember two specific examples of colognes done badly. One was my sophomore year in college. My RA in Potomac Hall wore way too much cologne. You could smell him coming way before you saw him. His fumes preceded him. Likewise, when I worked at Wal-Mart, there was this one guy who wore too much cologne who worked the cigarette line regularly. His fumes preceded him, too. He smelled awful because he wore far too much cologne. Well, folks, I made one of those changes last night that only happens once a decade. I changed my deodorant brand. I used to use Old Spice, but am now giving Brut a whirl. We’ll see how that goes, I suppose. But today is definitely the break-in period. Any time you change deodorant scents, even within the same brand, you can really smell it on the first day or so. So today, I can’t smell anything except for Brut. As far as I’m concerned, the whole office smells like Brut (even though I know it’s really me that smells of it). And this new scent is burning my nose. Seriously, it’s enough of a change that I’m getting that burning feeling in my nose. Of course, I’ll get used to the smell and then won’t be able to smell it anymore, but for now, it’s burning my nose. The only problem with Brut, however, is that it’s a bit harder to find than I expected. I went to Target and Shoppers with no luck, and then finally found it at CVS. So we might still be giving a few more things a try. And yes, this was a quick turn-the-phone-on-ourselves kind of shot. So how’s the new haircut look? So how does this look? I am officially designating my apartment a “Christmas-Free Zone”, because in going out anywhere, I’m bombarded with Christmas cheer, and it’s already gotten on my nerves. After all, it’s basically a holiday that celebrates capitalism at its worst, as people go to all this trouble to show how materialistic they are. After having worked four Christmases at Wal-Mart, I’ve found that the season really brings out the worst in people, as people buy their children’s presents right in front of them, and then turn around and lie to their children, telling them that it’s from “Santa Claus”. Give me a break. I can’t even go to Chipotle without getting blasted with Christmas music, either. Aspen Hill Shopping Center, which is where my local Chipotle is located, is piping Christmas music into their outdoor shopping center – loudly. It’s enough to really get on one’s nerves. The best example of what’s wrong with this season of rampant materialism is what happened at the Wal-Mart store on Long Island, where a worker was trampled to death while guarding the door. That’s just sad, really. It’s sad for the family of the employee for their loss, and it’s a sad commentary on our society that people value a person’s safety less than saving a few extra bucks on cheap Chinese-made crap. And the fact that Wal-Mart put this person – a temporary worker, no less – in that position primarily because he was larger in stature, makes me all the more annoyed. It demonstrates what I’ve known for some time – Wal-Mart doesn’t give a crap about their employees, and they will stop at nothing, and step on as many toes as necessary, to get to people’s wallets. That death was absolutely preventable, and I hope that the family of the trampled worker comes out well in court. I’d love to see Wal-Mart try to defend themselves on this one. I went into DC yesterday evening in order to pay my last respects to the Brian MacKenzie Infoshop, which is closing this month. It was kind of a bittersweet moment. On one hand, it’s a shame to see the Infoshop go, as it was more than just a bookstore, since even more so, it served as a social gathering place and meeting point for DC’s radical community. On the other hand, I’m happy that I got some closure to my four years of visiting the Infoshop. Recall that I first visited the Infoshop immediately following the Million Worker March in October 2004. While at the Infoshop, I picked up a vegan cookbook for 25% off. That excites me, since I absolutely love vegan cooking, but never have taken the time to try it out. Maybe this will get me to actually do some real cooking, vs. preparing stuff in the microwave (which isn’t “cooking”, in my opinion). I also found out that the reason the Infoshop was closing was due to its dwindling volunteer base, and loss of its lease. That’s a shame on both counts. I admit, however, that I had stopped going to the Infoshop a while back partly because of their hours changes, and even then, I would go down there only to discover that no one had showed up to open the place up, making the whole exercise a wasted endeavor. However, the location was amazingly Metro-accessible, being about three blocks from both Shaw and Mt. Vernon Square stations on the Green/Yellow Lines. One group of people at the Infoshop at the time of my visit was optimistic, however, that there would be another Infoshop in the future. I hope that’s the case, since despite its basement location (no “storefront” and therefore no foot traffic) and its erratic hours, it did serve a purpose for the DC radical community, as a place to share information and as a gathering point, as well as a place to chat with similarly-minded individuals. But for now, we must say “so long” to the Infoshop, and hopefully we’ll meet again one day in a new, rejuvenated form.